Hot Cakes turns 10, with sprinkles, of course. It’s that time of year when everyone finds the dark and gloom really charming—all whiskey cocktails and big bowls of pho and excuses to wear sweat pants all day—and not yet soul-sucking (hi, February.) Embrace the hygge life, and choose only the best excuses to get out of the house this month; these events are all worth a visit (and unfortunately most fall on the same busy weekend). 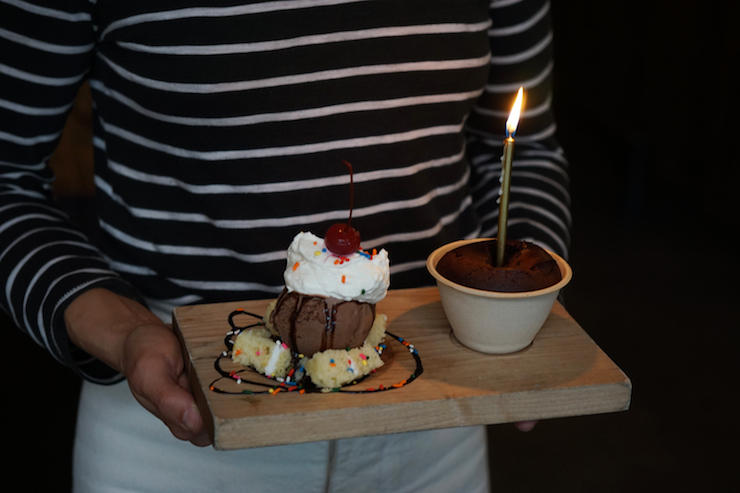 We love an excuse for a birthday cake, and dessert destination Hot Cakes is celebrating a big one: November 16 marks 10 years since owner Autumn Martin sold her first molten chocolate cake in a jar at the Ballard Farmers Market. Now, she’s a bit of a legend in these parts, with two locations of Hot Cakes, not to mention her involvement in booming plant-based ice cream biz Frankie & Jo’s. Between November 16 and 18, both Ballard and Capitol Hill locations will be selling a special birthday-themed molten cake (surely with lots of sprinkles); the first 50 guests in line that Friday at the Ballard shop will get a goodie-filled tote bag. Dine out for a good cause. Despite the incredibly low profit margins of restaurants in general, chefs are coming together with increasing urgency to support the causes that matter to them most. The latest example is +togetherSEATTLE, a newly founded organization from a group of restaurant industry folks who want to raise money for human rights. They plan to do so through a series of events, the first being November 14, when more than 120 local restaurants will be donating 10 percent of profits to the Northwest Immigrants Rights Project. See the full list of participating business here, and donate online if you feel so inclined. You should probably already be putting together your prep list for T-Day, ordering your pies from A La Mode and whatnot. But if the thought of leftovers has you salivating already, get over to Valhalla Sandwiches in Greenwood, for the awesome year-round Thanksgetting sandwich: turkey, bacon, stuffing, cranberry sauce, gravy and aioli all on a bun. On November 16, the Four Seasons hotel is hosting The Best Chefs You’ve Never Heard Of 2018, this year with a focus on female powerhouses. The list of 11 women chefs and mixologists is impressive indeed—including Martha De Leon of Café Juanita, Kaylah Thomas of JuneBaby, BJ Bresnick of Walrus and the Carpenter and Dionne Himmelfarb of Ethan Stowell Restaurants. A $75 ticket gets you some amazing food (check out the menu and buy tickets here), and proceeds benefit Northwest Harvest. One of our favorite local cookie bakers, Emily Allport, has finally found a permanent(ish) home for her popular Lowrider Baking Company. She’s set up shop at the Georgetown Trailer Park Mall, which launched Deep Sea Sugar & Salt into local stardom. If you’ve missed her cookies at pop-ups and farmers markets, you’re in for a treat: Try one of everything and thank us later.